The Northshore Association of Student Activists board members, artists and guests pose for a picture. NASA held an event showcasing student activist art Sunday. 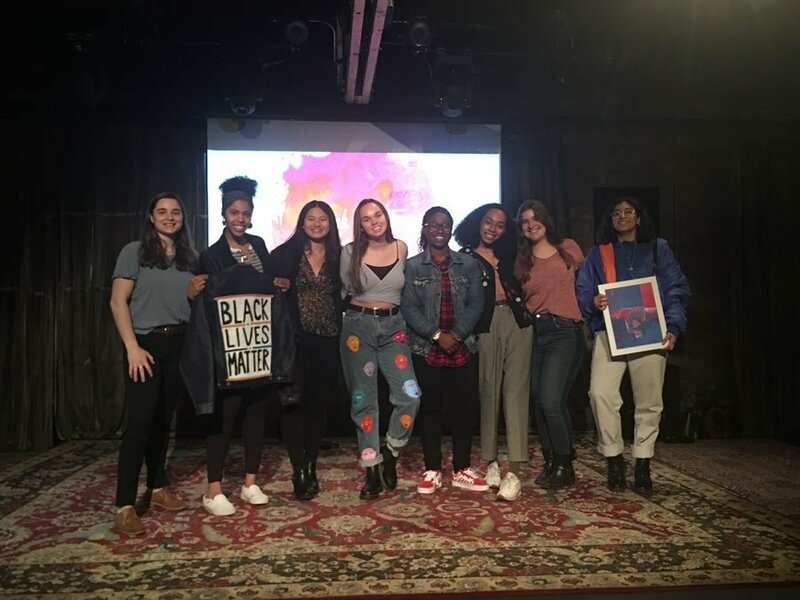 Students and community members gathered Sunday at Evanston SPACE to attend an art showcase organized by the newly-founded Northshore Association of Student Activists. The event showcased student artwork as well as singing, dancing and spoken word performances. The student performances focused on issues such as suicide, police brutality and gun violence, topics that NASA often interacts with. The organization’s mission is to unite “student activists across the Northshore in the pursuit of inter-school community building and fighting against physical, mental, racial and structural violence,” according to a flyer from the event. ETHS sophomore Nikki LeVee choreographed a dance called “Thoughts and Prayers” in response to the lack of action taken to prevent gun violence. Beacon Academy junior Teagan Springer created a piece of artwork: a mirror with red wire that spells out “Female Does Not Equal Fragile.” Springer said she hopes people can see themselves reflected in her art, “and think about those messages of femininity and fragility that are everywhere.” In Springer’s mind, femininity should be associated with strength rather than weakness. According to NASA member Isaac Slevin, a junior at ETHS, the main goal of the art showcase was to spread the word about NASA and show the community how the organization is working to create change and influence local policy. One of NASA’s current goals is to work to ban the NRA Carry Guard program in the state of Illinois, Slevin said. This policy, which has already been banned in two other states, provides insurance for gun owners to cover civil and criminal legal fees related to gun violence. NASA has created a petition to ban Carry Guard, and the organization hopes to eventually send the petition to Illinois Attorney General Kwame Raoul, as well as Gov. J.B. Pritzker. NASA has also recently begun protesting the construction of the Niles gun range, which is located less than a mile away from Niles West High School. Slevin said that it’s important for people to fight for issues impacting them at the local level.